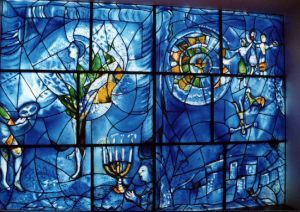 Jewish art used to be unrecognized and was merely for synagogue use although it spoke much about the history of Israel. Before the 18th century, Jewish art and literature remained dormant. Painters, writers, and artists were among the lowest in the society echelon. The hardship of Jews for their arts’ sake could be mirrored when one tries to find out the history of Jewish art. This is a Marc Chagall piece and resides at the Art Institute of Chicago.